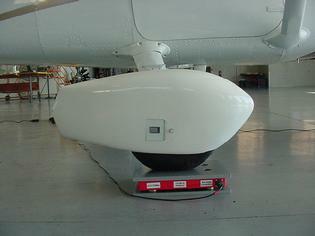 Mantracourt Electronics Ltd (USA) – There are a number of reasons why it is essential to accurately weigh an aircraft. Firstly, all aircraft gain weight over time; particularly in larger aeroplanes with paint applied, painting and not stripping, configuration changes and cabin equipment modifications. On smaller crafts such as lighter planes and helicopters, additional equipment such as cameras and communications apparatus will also add to the weight, as may certain repairs. Although the CoG is not a fixed point, the aircraft manufacturers set limits and any deviations from this may seriously compromise both stability and control. 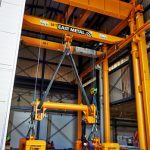 New aircraft are also weighed during development, especially when test flights are being carried out, to test load capacity, stability and safe operating limits. How is an Aircraft Weighed? 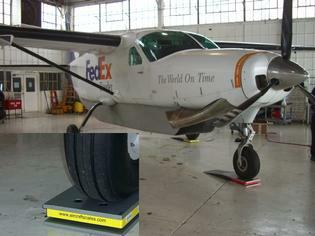 There are a number of methods used to weigh aircraft. The most popular methods use scales or ‘platforms’ under each wheel. 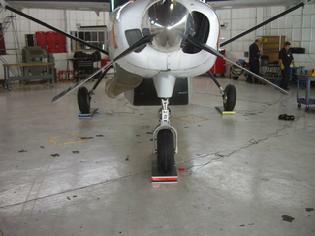 The aircraft under test is towed, ensuring each wheel is positioned accurately on the weighing platforms. Each weighing pad contains accurately calibrated load cells that measure the weight at each wheel and combine these together to give the overall weight of the aircraft. Although extremely accurate and cost-effective for smaller aircraft, when one considers an aeroplane such as the A380 that has 22 wheels, this option can seem expensive. 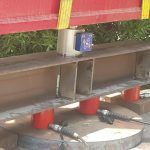 The other accepted method is to use under axle jacks with a calibrated load cell placed on top of the jack. The jacks are then raised, lifting the aircraft off the ground, and transferring the load from the ground to the load cell. 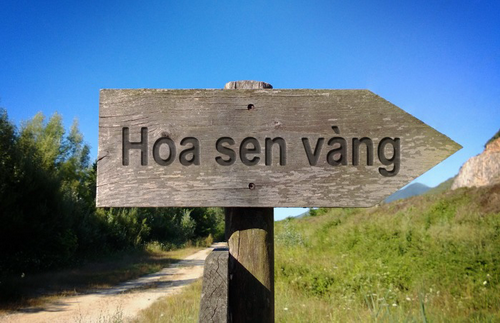 However, cost is not the only consideration. Safety, ease of use and time all have to be taken into account. In order to ensure the most accurate readings, aircraft weighing should take place in a closed environment to avoid air currents and all equipment should be properly calibrated by the scale manufacture and zeroed before use. There are a number of specialist companies throughout the world that provide systems for aircraft weighing and one such company, Jackson Aircraft Weighing Service, J.A.W.S., based in Florida, USA, is a full service aerospace weighing company with sales, calibration service, on site weighing and rental scales for aviation applications. Aircraftscales.com and Helicopterscales.com are divisions of Jackson Aircraft Weighing Service. They believe they are currently the only full service manufacturer that offers products for rental or short-term lease but, more importantly, they can offer unbiased advice on the optimum system for any particular aeroplane, helicopter or UAV. In both the platform and jack methods, output from the load cells needs to be transferred to an indicator. Traditionally, this is done with a wired system where a cable is connected from each of the load cells to an instrument where the readings are displayed. For some users, this is adequate and many companies are still happy with this approach which works extremely well. Companies like JAWS still supply wired systems but over the years have been developing ever more sophisticated, yet easy to use, wireless systems that have many advantages over the wired systems. The first and most obvious advantage is the lack of wires. Not only do they pose a health and safety risk, but, in certain applications replacing damaged cables can be awkward and expensive, whilst fault finding on complex systems can also be time-consuming. In fact, JAWS is now in the process of accelerating its wireless options and conducting retrofits from wired to wireless conversions. This provides all their customers with product lines complete with fully vetted software applications, print outs, hand held displays and, in general, a very high quality production capability. Why Mantracourt and Why Wireless? Mantracourt Electronics is a leader in high precision measurement electronics and supplies OEM sensor manufacturers and system integrators around the world with innovative and reliable measurement solutions. It was the company’s latest wireless offering, T24, and the fact that Mantracourt’s electronic engineers worked closely with JAWS technical aviation weighing specialists to devise customised solutions that meet the exact requirements of JAWS customers that made Larry Jackson’s decision to choose Mantracourt easy. Mantracourt’s T24 is a modular wireless telemetry system for multiple data acquisition in real time. The range comprises a versatile set of products based around proprietary acquisition devices that can be mixed and matched to provide high quality remote readings for critical applications. The system comprises a range of transmitters, interfaces, displays and output modules that can simply and easily be configured to suit individual applications. The transmitter modules have been designed to collect data from a large range of industrial sensors and, in the case of JAWS, especially calibrated matched load cells. The low power, battery equipped radio units allow data collection over many years without externally supplied power and so are considerably more cost-effective than hardwired systems. To further add to the versatility of T24, Mantracourt provides data logging and visualisation software. This allows users to log up to 100 channels and build visual mapping displays. Alarms can be set that can indicate under and over range and can alert users of loss in communication, low battery and error reports. The Mantacourt development team worked with JAWS to meet their special process calibration requirements and printable output applications. Another consideration JAWS had to take into account was the fact that its weighing units were not only vital bits of safety equipment and had to be extremely accurate at all times, but they knew that as they supplied the rental market then the equipment would be subjected to continuous and often harsh use. Quality and ruggedness was yet another quality displayed by Mantracourt’s equipment. Wireless systems are becoming more prevalent throughout industry and as they start to become incorporated in such critical weighing applications as in the aviation industry, then it is even more important that they are reliable, secure and free from interference. As has been shown above, choosing a wireless system supplier that can work closely with your team to develop a customised solution is vital and keeps companies ahead of their competitors. Larry Jackson is a licensed FAA technician and inspector with 38 years in the aviation trade. Jackson Aircraft Weighing Service was formed in 1993 and continues to service and serve in the aviation trades for all weight management services, programs, equipment sales and program development and is a worldwide supplier. For more information about the Wireless Telemetry Sensor System from Mantracourt click here.